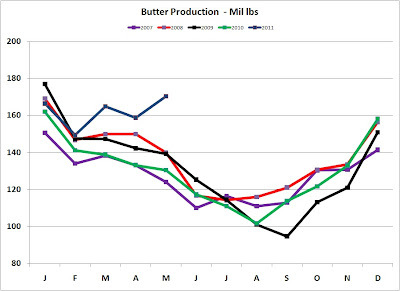 As expected, June dairy prices announced on July 1 were very positive. 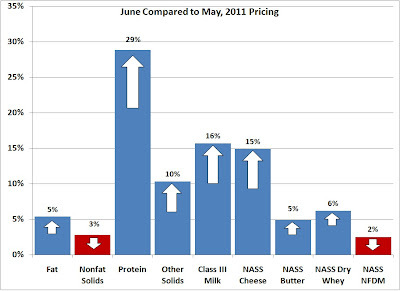 Component prices for Protein hit a 2011 high at $2.98/lb and butterfat stayed high at $2.37/lb. Component price charts are shown below in two formats. One shows the evolution of component prices since the establishment of the the current system in 2000, and the other similar chart shows the evolution since the period of significant volatility starting in 2007. What is driving these prices? First, the formulas will be examined, and then the underlying supply, demand and inventory statistics will be analysed. 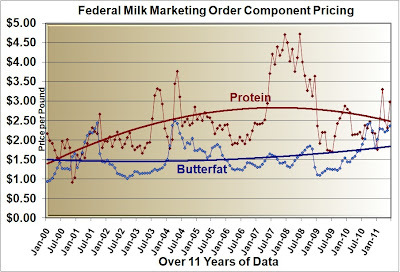 The second chart above on the evolution of pricing is shown to illustrate the offsetting impact of high butter prices on milk protein prices. 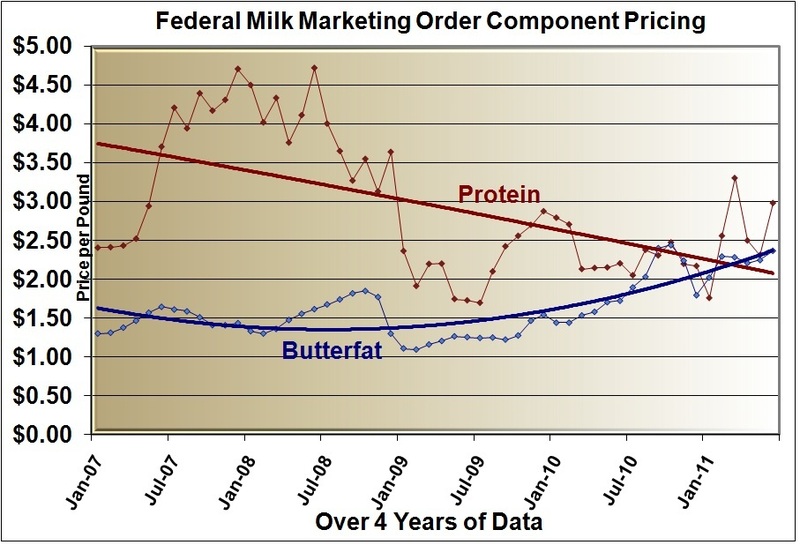 As butterfat goes up with the butter price, the value of protein goes down. Protein value is determined by a rather complicated formula which takes into account two factors. 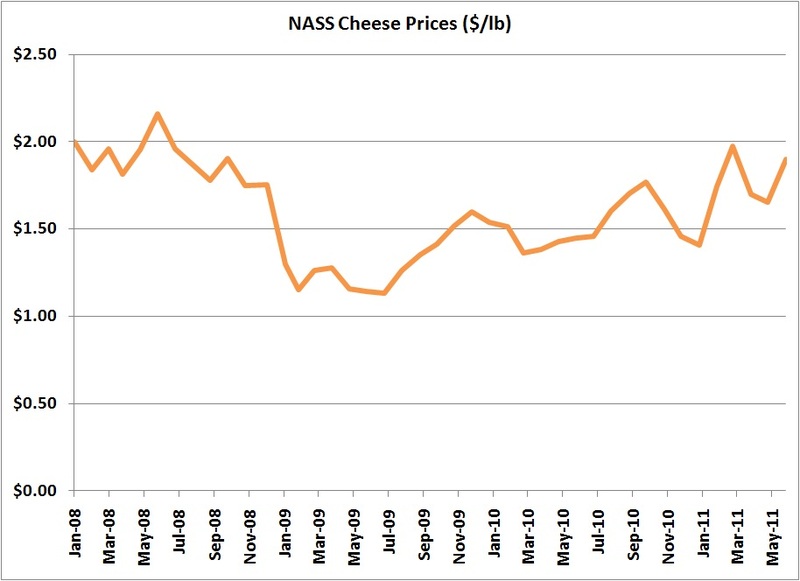 Protein price = 1) the price for protein based on the wholesale price for cheese +2) the value of butterfat when it is used in cheese rather than butter. The formula itself looks like this. 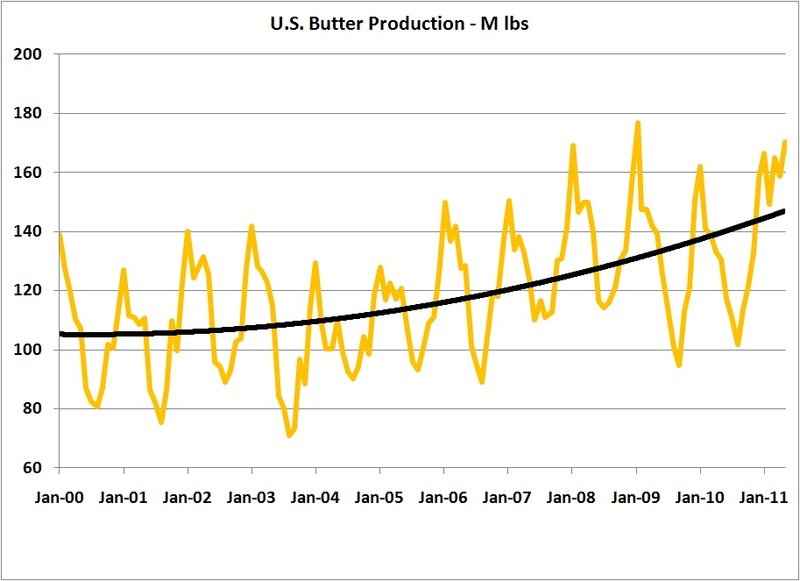 Typically, the value of butterfat when it is used in cheese is much higher than when it is used in butter. Current prices are not typical. Butter has been in very short supply and therefore butter and butterfat have remained very high.June value of each factor is as follows. 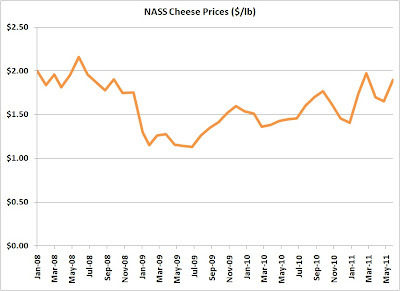 Protein prices = $2.35 based on cheese prices + $.63 based on the relative value of butterfat in cheese rather than butter. The total is $2.98/lb. 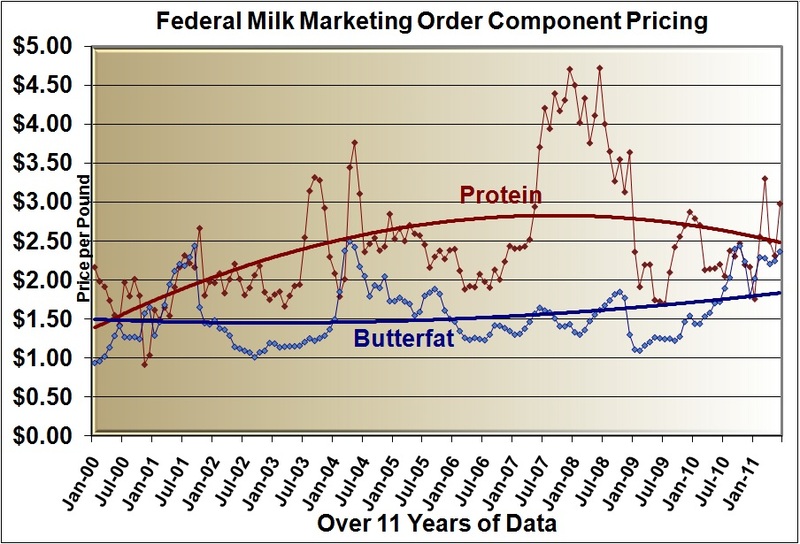 However, if butterfat was more normally priced at around $1.50/lb, protein would have a much higher value, $3.89/lb. 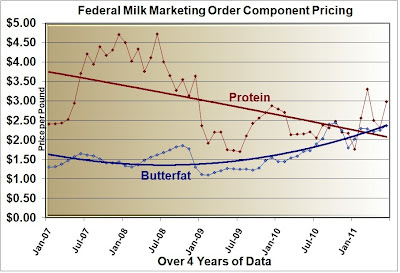 This exercise was shown to illustrate the impact of the abnormally high butter price on milk protein prices. 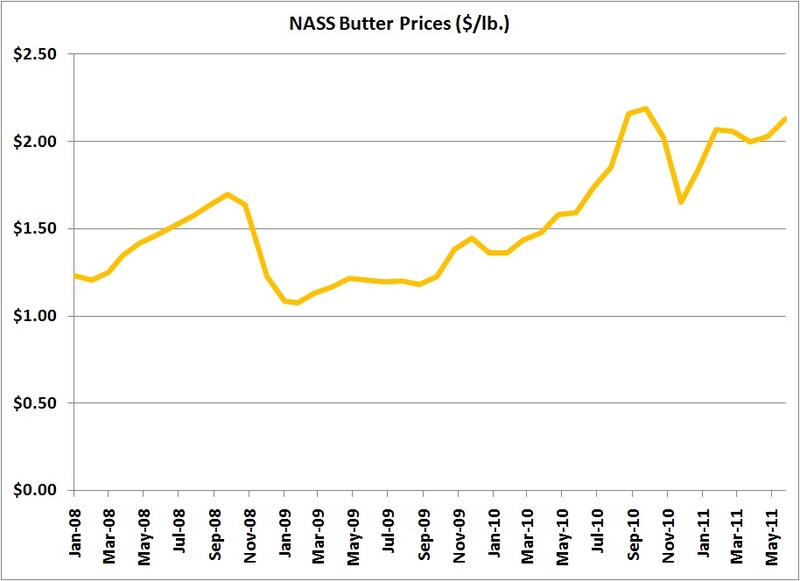 Once butter inventories return to more normal levels, butterfat prices will return to more normal levels and protein will again attain a price approaching $4/lb. A more detailed explanation of this relationship was analyzed in the August 8, 2010 post to this blog. 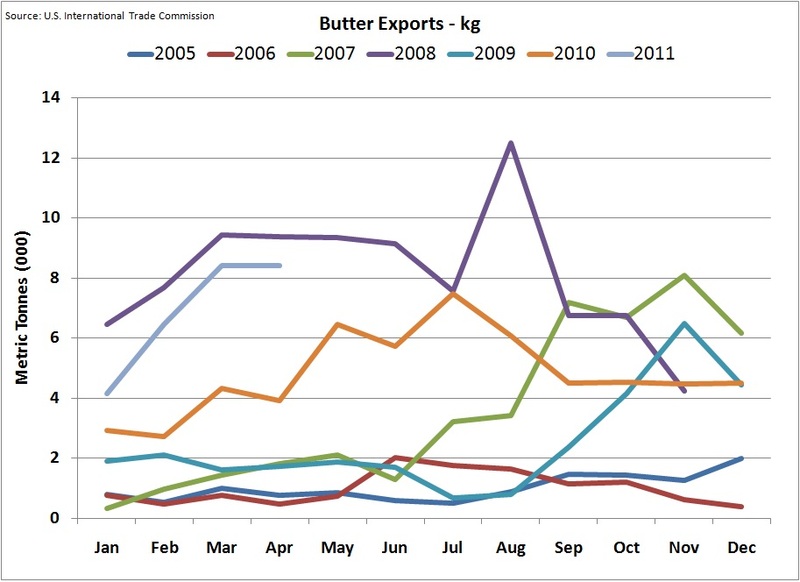 The butter story is consistent with all the prior months; strong exports, improving production, low inventories, and high prices. 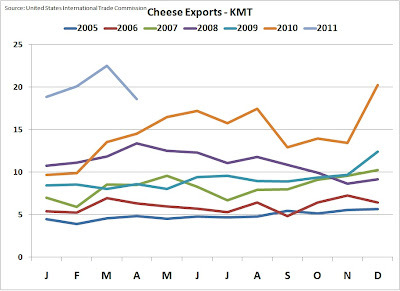 Exports continued to be the strongest since the exceptional months of 2008. They are well above the levels of 2009 and 2010. 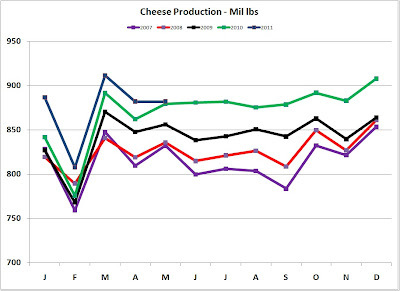 Production in May was the second highest month ever, only exceeded by January, 2009. 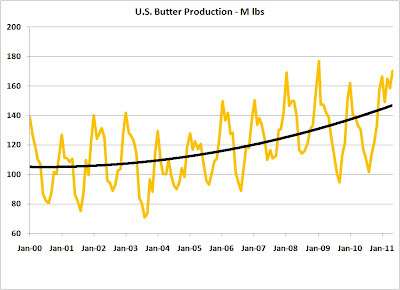 Butter production was low in the last half of 2009 and most of 2010, but production has recovered in 2011. 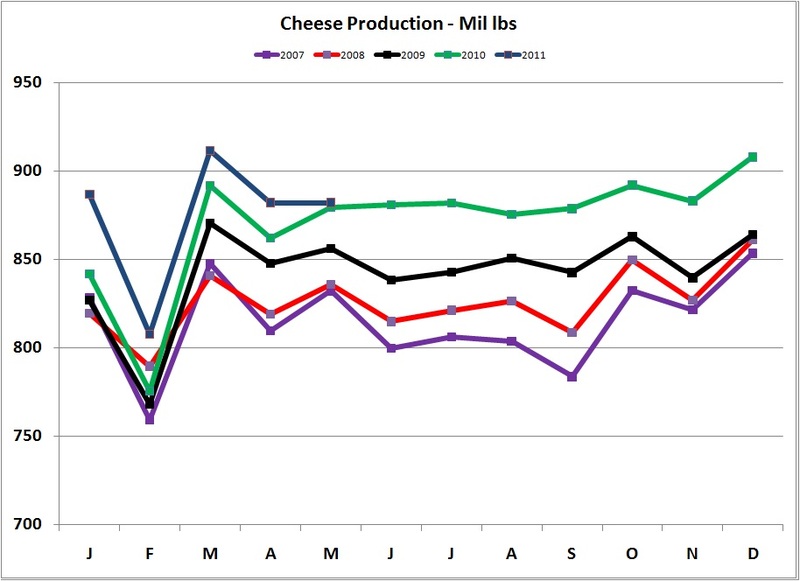 In order to meet demand, production will have to continue to improve. 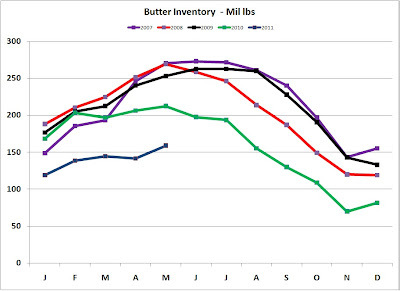 Butter inventories improved slightly in May, but remain low, especially in view of the higher levels needed for the higher demand. Inventories would nearly have to double to reach "normal" levels. This will take a very long time. 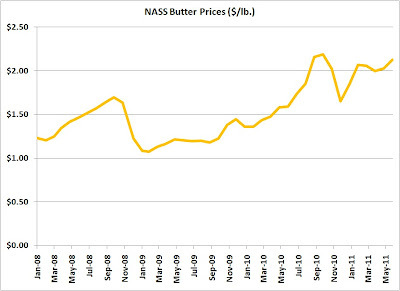 As a result of the strong demand and low inventories, NASS butter prices have remained above $2/lb. Current CME prices which are reported ahead of NASS prices show almost no change in pricing. There is very little reason to expect price changes in July. Butter will remain high. 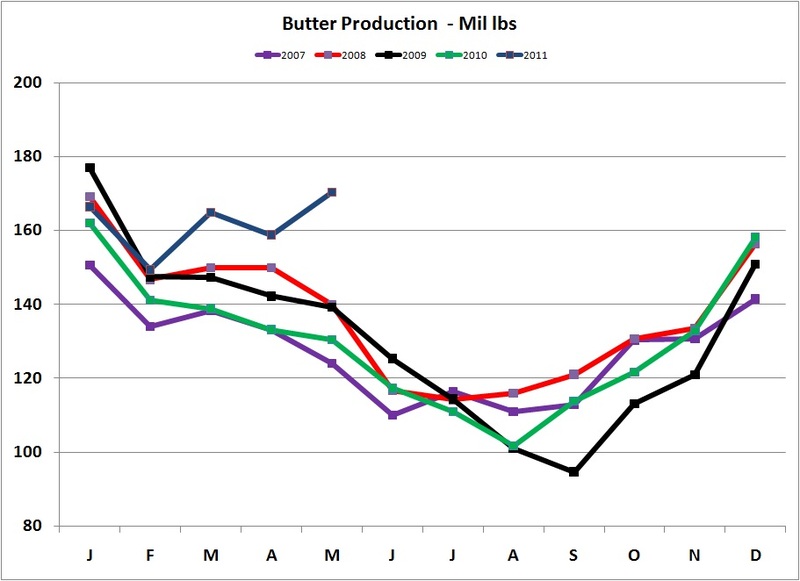 The butter situation is very transparent and has not changed much in nearly a year. 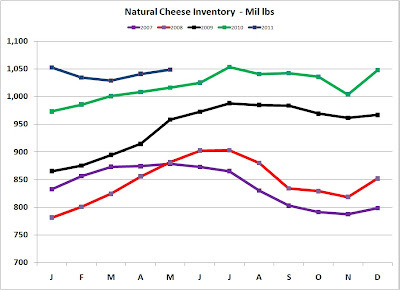 Although the inventory levels seem to be improving, they still have a long way to go to reach "normal" levels. 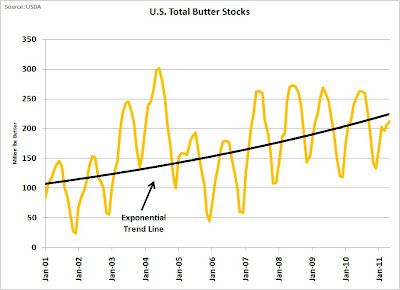 The only question on butter is how long this situation will continue. It would appear that any changes will be slow to come and high butter and butterfat prices will continue for an extended period of time. 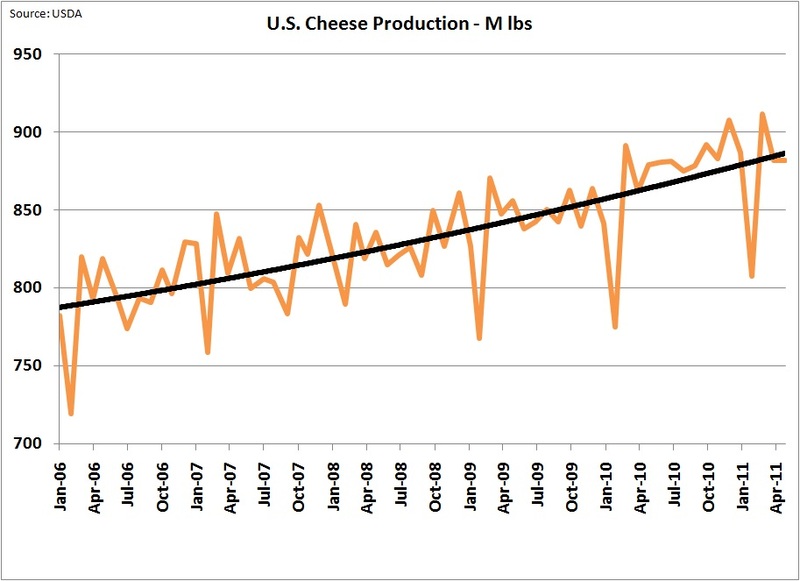 Throughout the last half of 2009 and the first half of 2010, cheese production outstripped demand and inventories were bloated. 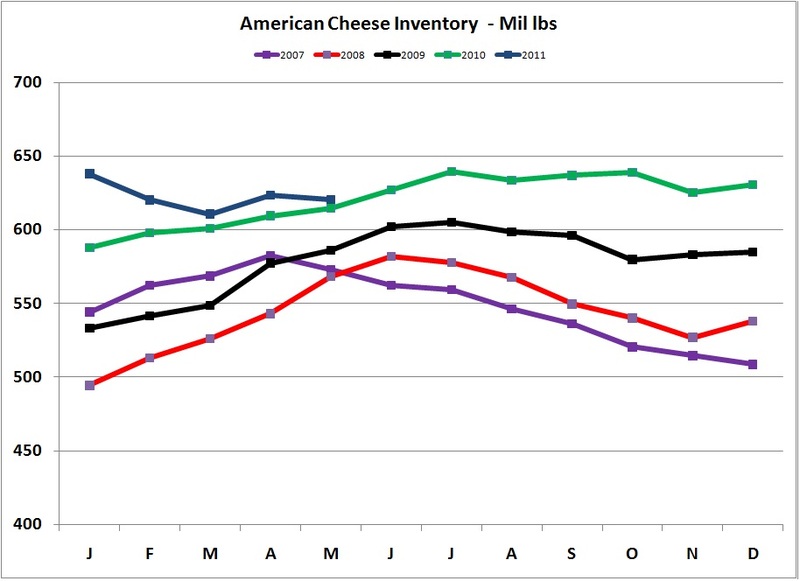 As a result, cheese prices crashed reaching a low of $1.13/lb in July, 2009. 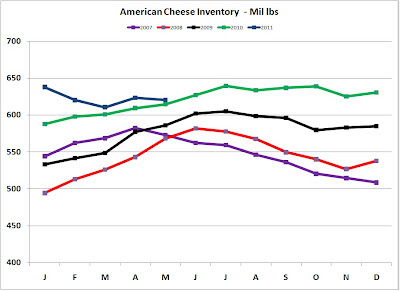 They have now recovered to $1.90/lb. 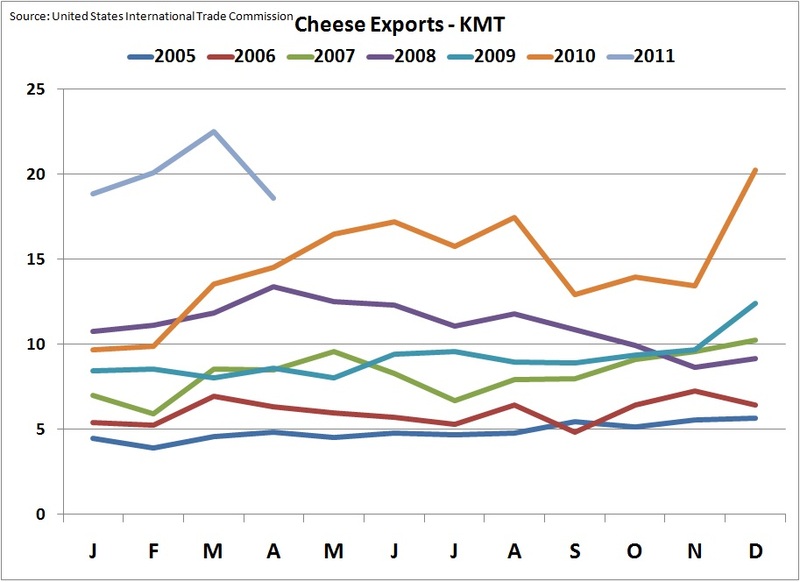 Cheese exports remain strong although the April, 2011 dip is a little concerning. May data is not yet available, but will hopefully show improvement. The weakness of the USD vs. the New Zealand Dollar and the Euro and the strong export assistance programs in place should continue to drive healthy exports. 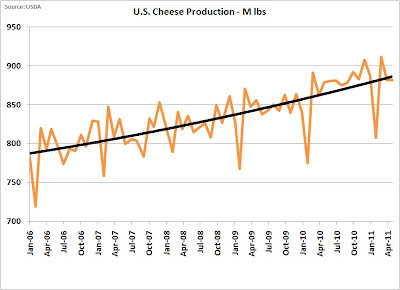 In June, 2009, cheese production began to surge, just as world demand softened. The surge continued through most of 2010 and has only recently slowed down. 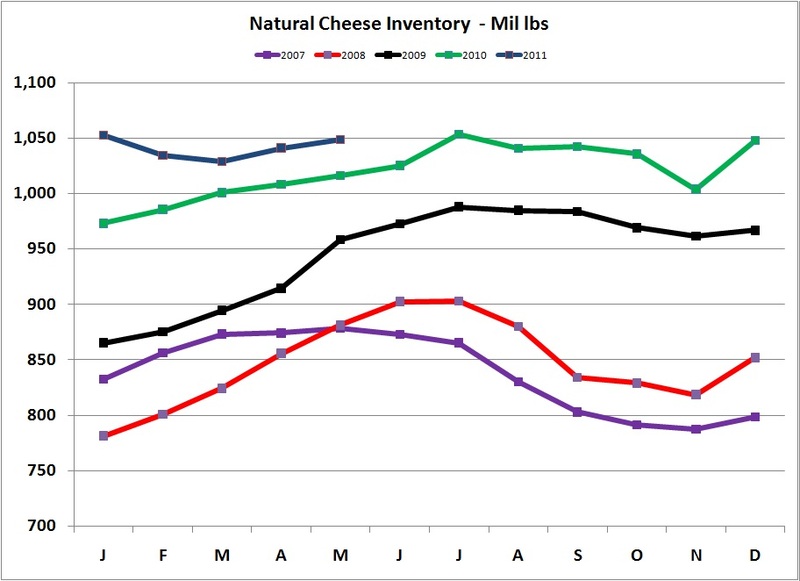 Inventories of Natural and American cheese which were too high from late 2009 through much of 2010 are now coming back into line. While they are still somewhat high, the increased demand brought on by healthy exports have helped to normalize stocks. As a result of the lower inventories, price recovery has started. Based on current CME prices which lead the NASS prices by about two weeks, the NASS prices can be expected to at least maintain current prices and perhaps improve. The outlook overall remains very healthy for the U.S. Dairy industry. Corn prices seem to be moderating somewhat and milk component prices should remain high. 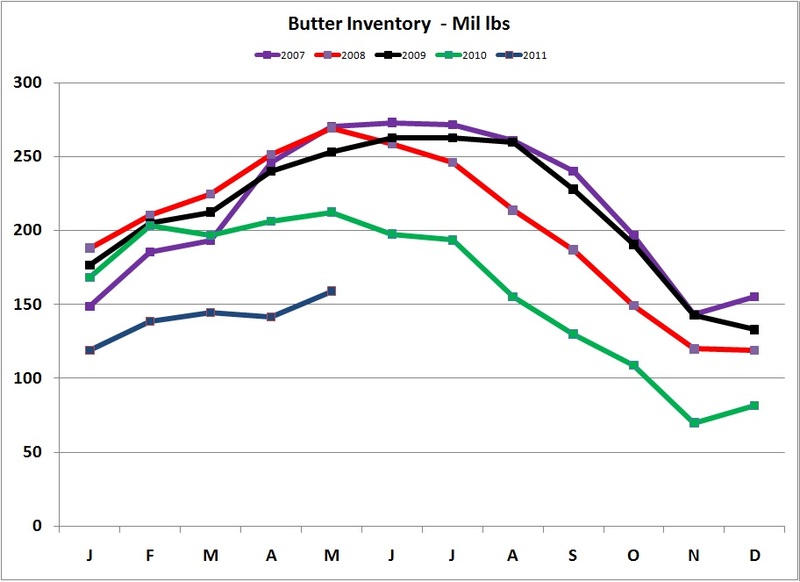 As butter inventories improve,over time, butterfat will drop in price, but this should have very little impact on the Class III milk price (see the April 23, 2009 post to this blog for the math). 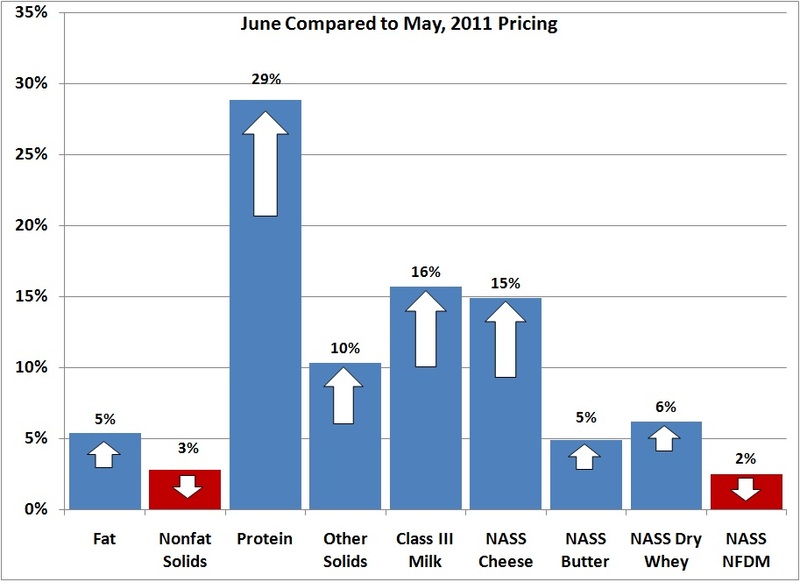 Lower butter prices will lower butterfat prices and increase protein prices, but in total Class III milk revenue should remain healthy.